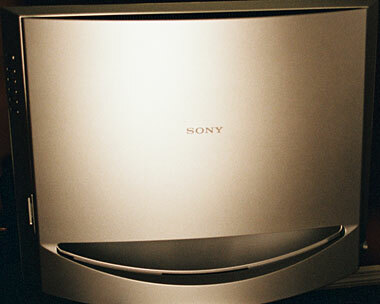 After much success in 2003 with its first 23" LCD television, Sony replaces the KLV-23HR1 with the second generation KLV-23HR2 Sony LCD TV in Spring 2004. Besides some fairly substantial cosmetic changes, Sony has introduced a new slot for its digital Memory Stick, allowing the user to upload and view sensational photographic images on the KLV-23HR2's high-resolution screen. While the manufacturer's specs—including the resolution—remain unchanged, I did notice some improvement in the KLV-23HR2's conversion processing, giving it even clearer picture detail than the KLV-23HR1 had. This Sony LCD TV offering is a high-end, high-quality product. It competes with the likes of Sony's highly touted AQUOS line and other lines of premium LCD television displays. This Sony LCD TV model is an impressive performer. Sony's 23" LCD TV screen has a native resolution of 1280 x 760, which is enough to convey a lot of high-definition detail at 720p or 1080i, though, at this point, that can actually be more of a liability than anything else. There just isn't a whole lot of high-def content out there yet, and watching DVDs at 480p on an XGA monitor can be disappointing, depending on how well the display upconverts a 480p signal to an XGA resolution. So, I was especially pleased to find that the KLV-23HR2 does a marvelous job "fitting" 480p signals to its 1280 x 768 display canvass. Not only were the images from The Last Samurai sharp and crisp, they were lavishly detailed too. What was already there content-wise came out quite nicely at a higher resolution. With electronics, you get what you pay for, and if you're paying for high resolution, you better make sure you're also paying for the signal processing mechanisms to back that resolution up. Otherwise, you could get stuck with a "high-resolution" picture that looks fuzzy. The Sony KLV-23HR2 gets high marks for its signal-processing/converting abilities, which made a 480p signal come to life in high resolution. The Sony LCD TV is particularly good at conveying detail, thanks to its extra-bright, extra-sharp, extra-resolution picture. Everything from Tom Cruise's matted tresses to the extra-fine grain of the woodwork in the village temple shone with brilliance. This level of detail is not exactly "high-definition," but it was high-impact nonetheless. Such detailing lent The Last Samurai a visual depth that more than made up for its mental superficiality. There are some really pretty landscape scenes in The Last Samurai, which the KLV-23HR2 colored nicely. Take the shot of Mt. Fuji draped in sunset hues at the beginning of the movie, for example. There is a slight haze to those colors, no doubt because of fog or ocean mist reflecting them, yet the mountain came through still looking real behind this otherworldly coat of colors. Stunning. Later in that same chapter, Tom Cruise docks in the harbor and enters a bustling Japanese port village. The sheer volume of activity invites the eye to inquire all over the place, and everywhere I looked on the screen, the detail of the peoples' faces, of their buckets or whatever else they were carrying impressed me. Such detailing was also apparent in the glowing ashes that flew as a village blacksmith hammered away. The ashes beamed brightly as Tom Cruise passed by, lighting his face as he peers off into the distance (or at you, depending on how you see it). The effect was almost surreal—a sure sign of quality in an LCD display. The KLV-23HR2 has good black levels and good shadow detailing. I was actually able to make out the folds in Kazimoto's dark-blue (not black) kimono. When I adjusted the picture setting using a Video Essentials disc, I observed how well this Sony holds its black levels as it is forced to switch low- to high-average picture levels. All of which makes this LCD TV perfect for watching television during the day or in well-lit rooms. I actually felt like the black levels were better with a lamp on than with all the lights out. Of course, this is not to say that the Sony LCD television doesn't perform well in the dark, because it does. 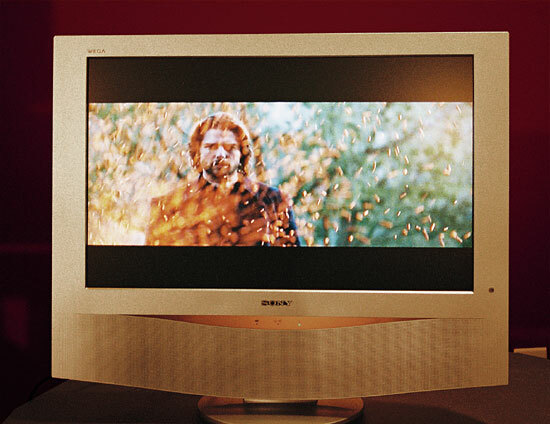 Even without a black "frame" around the screen, which supposedly helps with contrast, the KLV-23HR2 LCD TV held its own in a head-to-head comparison of its blacks to those of a 22" Sharp AQUOS LCD TV. Note: The TINT (a k a "HUE") setting cannot be adjusted for component video or DVI video signals. I have to admit I was a bit disappointed by the size of Sony's on-screen menu, which was small enough that I actually had to move closer to the screen in order to read it. Granted, this is a relatively small screen size, so one would naturally sit closer to it; but viewing and reading are two different things, and reading the menu options was hard to do at a comfortable viewing distance. I'm quibbling here, I know, but the size of the type in the menu irked me. 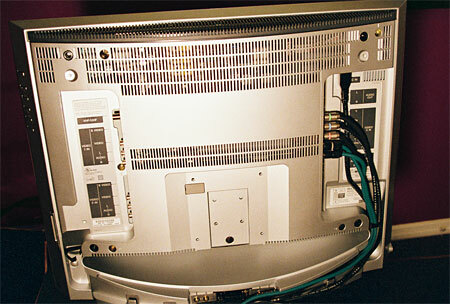 Listed under the PICTURE section of the Sony's on-screen menu was a BACKLIGHT setting, which allows you to adjust the intensity of the lamp powering the picture on your LCD screen. Obviously this setting affects the relative brightness of your on-screen images. So, it will definitely help you get the best contrast depending on your particular viewing circumstances. But there's more to it than that: This feature enables viewers to maximize the longevity of the light source on their TV—to adjust it up or down on an as-needed basis, depending on the ambient lighting situation. It only stands to reason that lowering the BACKLIGHT setting will increase the lifespan of your LCD's bulb. Which is a good thing, unless you have money to burn on burnt-out florescent bulbs. Note: In the KLV-23HR2's manual, Sony advises people to "consult qualified service personnel" for lamp replacement, which tells me that the florescent lamp on this LCD TV can be replaced, and presumably for less than the cost of a new display. I guess we'll have to wait and see. Sony has made much about its LCD Panel Driver LSI technology, which is supposed to minimize the blurring of images in motion. I believe it: I noticed precious little in the way of pixelation during my screening of The Last Samurai. Even scenes where galloping horses have legs tailor-made for pixelation, there wasn't any. If there was any pixelation, I wasn't bothered by it enough to even take notice of it. Alas, Sony won't pass the smell test with its claims of expansive viewing angles on this LCD monitor. Sony claims this LCD flat panel TV has 170-degree viewing angles. As I saw it, however, the KLV-23HR2's viewing angles were closer to 140 degrees. Any further off center and the picture quality diminish noticeably: the screen dimmed, colors washed out, etc. The vertical viewing angles were a bit better—maybe 10 degrees wider. These are reasonably obtuse real-world viewing angles for an LCD display. The Sony KLV-23HR2 is a better-than-average-if-not-good TV. And that's about it: Sony did not put a VGA input on the back of this LCD TV, so you can't use it as a monitor, which is a shame because this TV could really display some graphics. And at these prices … well you would expect to get a monitor too. Besides this most obvious omission, just about everything about this Sony bespeaks its quality. It comes with a built-in NTSC tuner for watching "regular" TV. It also has built-in speakers, which sound surprisingly good for a unit this size. Its WOWä Audio Effect, when enabled, boosts the base levels and improves the mid-range audio, which helps to clarify dialogue and such. The effect is pleasantly surprising. Right after Tom Cruise gets sacked as a shotgun pitchman, he walks into an alley, where Billy Connolly is waiting for him, applauding. The sound was so realistic as it came from the KLM-23HR2 that you might have thought someone was actually in the room with you, clapping in time. The Sony handles dialogue wonderfully, though it is less adept at handling explosions with the sort of aplomb that you get from floor speakers. But speakers like that take up space, and this LCD TV is all about saving as much of it as possible. Sony's 23" LCD display is also about minimizing the mess of cable connections that blemish an otherwise sleek and stylish TV. To do this, Sony has equipped this display with a removable back, behind which one can organize the cable chaos. The idea is to channel all the connectors out the back of the LCD TV in one neat column. Which is an admirable goal. Though, for me, it was an ultimately unrealizable one. I had trouble fitting all my component cables into this "trunk," so I had to leave the back cover slightly ajar, bulging at the seams with Monster Cables. Before: Sony's innovative cable management keeps a tangle-free installation. After: A sleek removeable back cover hides cables completely for a clean look. The TV itself feels substantial on the counter, though never heavy or (gasp!) boxy. You can hang this TV on the wall, but I rather like the way it sits upon its base—firmly. This is one solid LCD display: You can adjust the angle of its screen by simply pushing it away from you or pulling it toward you. There is nothing dainty about this process; you just hold on to the base and move the LCD screen. I find such things reassuring in a high-end flat-panel display, which can feel (and sometimes be) overly delicate. Sony's LCD TV is anything but fragile-seeming. While it is on the square side (only 5" wider than tall), Sony's 23" LCD TV is pleasantly styled, with a matte aluminum finish and tactful badging on Sony's part. This LCD TV strikes a nice balance between high-tech and high-style. The KLM23HR2 supports all the scan line formats (480i, 480p, 720p, and 1080i), so this is truly a HD-capable unit. Furthermore, it has 2 composite vide inputs, 2 S-video input, 1 component video input, a DVI input, and 3 RCA-type audio inputs. It also comes with a VHF/UHF connector for an antenna. The remote is a universal one, though, inexplicably, not back-lit. This is surprising coming for Sony, which usually comes up with exceedingly well-thought-out designs. Sony's 23" LCD TV comes equipped with an input for its Memory Stick, which allows one to view things like digital photos on your TV or even record other digital data (read: TV and movies). That's the good news. The bad news is that Memory Stick compatibility pretty much limits your playback options to other Sony devices. With an MSRP of $2699, the newest Sony LCD television is a bit pricey. You can expect to see the KLV-23HR2 retailing for about $2200 on the street, which is still quite a bit if money for a 23-inch screen. You are definitely paying a premium for the Sony's 1280 x 768 resolution, but this is money well spent: The Sony KLV-23HR2 has the processing capabilities necessary to get every bit out of its high-resolution screen. What you don't get is a really good LCD computer monitor. Which is why I give the Sony slightly lower marks in the Value department. This is a television you might place in a bedroom, bathroom, or possibly even a living room, if you were short on space. The KLV-23HR2 offers a great picture and is a rock-solid display—and you have to pay for such things, only you might wish you got a bit more screen for your money.